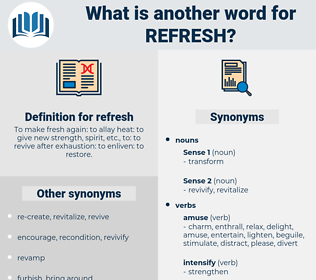 What is another word for refresh? 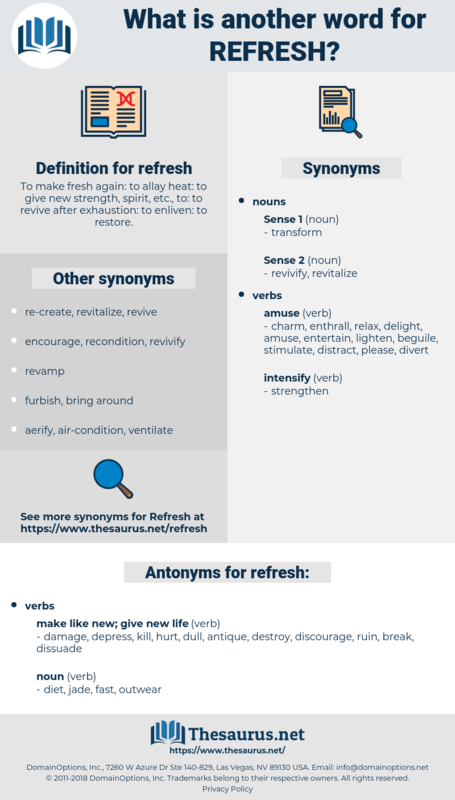 To make fresh again: to allay heat: to give new strength, spirit, etc., to: to revive after exhaustion: to enliven: to restore. giving a new look to. jog, rejuvenate, rehabilitate, revive, refurbish, actualize, renovate, revitalize, revamp, reinvigorate, replenish, modernize, restore, renew. damage, depress, kill, hurt, dull, antique, destroy, discourage, ruin, break, dissuade. Food and drink were brought from the city and the hungry warriors were about to refresh themselves, when they perceived that the fugitives of the several peasant armies had united, and were returning to challenge once more the fortune of battle. He did so to " refresh, people, and adorn the said country otherwise badly enough inhabited and desert in many places." reprise, reappraise, River Kasai, reprocess, reprize, reforge, repercuss, row of bricks, ropebark, rubric, roof rack, revers, rerebrace, river horse, rubberise, rephrase, reproach, rubberize, reverse, repress, reovirus, repurchase.